Part Two out of Four. After this you're halfway! Not of this marathon of course, this sucker is massive. 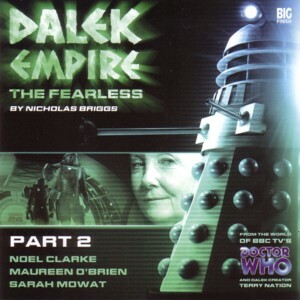 I just meant of this fourth series of Dalek Empire. You get it. "The Earth Alliance is on the brink of victory in the Kedru System. But at what cost? Meanwhile, deep within the Dalek Empire, Susan Mendes prepares for her latest mission…"
What did you think? Are the Daleks going to win? Is Susan Mendes related to Sam Mendes? Damn. Noel Clarke is....really good in this. Kade is one of the most relatable characters we've seen in the Dalek Empires I think. Watching his reaction to losing his family is heartbreaking. Landen is also quite relatable. She's in charge and she acts the part, but I like that in some instances her voice shakes. Even though she fully understands what's happening, I love that hint of pure humanity breaking through. It's also really present in scenes where she's mentoring Kade. It's very well-acted by O'Brien. It's like these Doctor Who alumni have an idea what it's all about! I feel like a lot of this episode was just set-up for the rest of this Empire series. Interesting to once more intersect the Suz/Angel of Mercy storyline. It seems like the audio-dramas keep circling back here, interesting to see it all from different perspectives. An interesting end to this episode and set-up for the rest...looking forward to listening to the next episode. It was too obvious the fate of Kade's family, because they had to get him to the point of the very damaged war soldier. He even told her that they are why he's staying alive. Of course they're doomed. Aside from that, I rather liked his struggle and then him agreeing to the task. Curious to see what happens next, which is a lie because I already heard Chapter Three. Noel Clarke is still amazing.